Remote S for Tesla, a popular iPhone and Apple Watch app that allows Tesla Model S owners to control their cars remotely, has been updated to take advantage of a big new addition to Tesla’s Autopilot feature. That new update, part of a the new Autopilot 7.1 release, brings a feature called Summon which allows owners of Tesla’s Model S to remotely move their cars without anyone being inside. As you might now be expecting, the updated Remote S app for Tesla leverages Autopilot’s Summon feature to allow Model S drivers to remotely move their vehicles using nothing more than a tap of their iPhone or, impressively, their Apple Watch now. 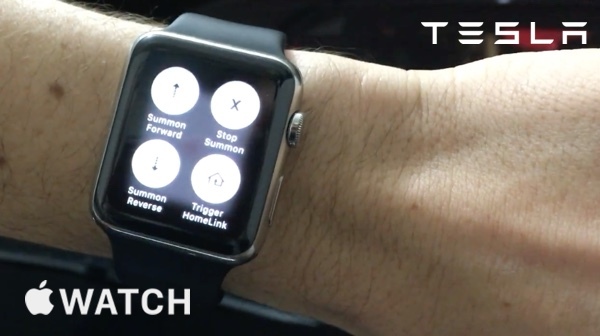 To show what Remote S for Tesla is now capable of, one of Tesla Model S owner Mark Schey has shared a YouTube video which shows his car being reversed out of a garage remotely by simply tapping an icon on an Apple Watch. The app even takes care of opening and closing the garage door, as if the idea of the car driving itself wasn’t impressive enough. Furthermore, Schey has also discovered that there appears to be no distance limit on where this app can tell a Tesla to go. Using Tesla’s own implementation of Summon, a limit of 39 feet between the car and its key fob is in place, and while that’s still the case with Remote S for Tesla, that appears to be the only limitation in place. While we’re not sure we would be able to bring ourselves to trust Summon to cover any real distance, Tesla’s Elon Musk has said recently that he expects it to eventually be capable of driving cross-country while charging the car up at charging stations along the way. We might be a way away from that happening just yet, but that doesn’t make the video any less compelling! The key fob doesn’t need to be near the car to use Summon. The user simply needs to tap on Keyless Start to enable Summon without the key fob. I’ve got to get me a Tesla!! !